Georgia RB Nick Chubb's medical evaluations will factor in heavily on where he is drafted. Nick Chubb, RB, Georgia (5'10, 220): (9) Auburn at Georgia, 3:30 p.m. When Georgia lost Todd Gurley for the season in 2014, Chubb came in and the Bulldogs' run game didn't suffer all that much. Insert Chubb, and everything was fine. 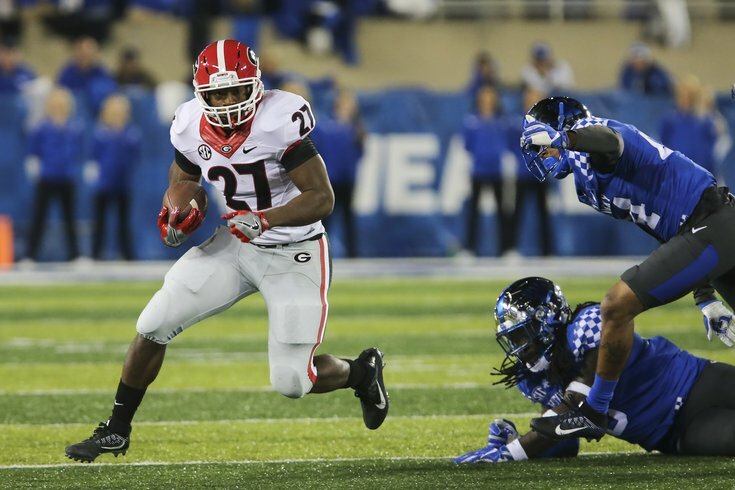 In his first five games in 2014, playing second fiddle to Gurley, Chubb only had 31 carries for 224 yards and 2 TDs. As the starter, Chubb lit it up in the final eight games, carrying the ball 188 times for 1323 yards and 12 TDs. In 2015, he picked up where he left off the previous season, rushing 91 times for 745 yards (for a ridiculous 8.2 ypc) and 7 TDs in his first five games. And then he suffered a grotesque injury in his sixth game against Tennessee that ended his season and drastically affected his likely draft position. Post-injury, Chubb's numbers are way down. In 2016, Chubb has 146 carries for 691 yards (4.7 YPC), and 5 TDs. There were questions as to whether or not Chubb would be back in time to start the 2016 season. Impressively, he was ready to go Week 1, but it's probably safe to say he's not the same back he was pre-injury. Chubb has a low center of gravity and runs with power and balance, but as you can see in the video above, he also runs with good vision, he makes effective cuts in traffic, and has good enough speed to rattle off long runs. Greg Pyke, OG, Georgia (6'5, 313): (9) Auburn at Georgia, 3:30 p.m.
Pyke started at RG for Georgia in 2014 and 2015, before moving to RT in 2016. Heading into 2015, Pyke was thought to be a potential candidate to leave early for the 2016 NFL Draft, but had a disappointing season and was even benched for one game. His potential appeal to the Eagles will be that he played both at guard and tackle, as Doug Pederson values versatility. The Eagles will have to determine if he is truly versatile, or if he's nothing more than a guard prospect at the next level. James Washington, WR, Oklahoma State (6'0, 205): Texas Tech at (13) Oklahoma State, 3:30 p.m. If you'll note the receivers we've profiled so far (at the bottom of this article), many of them are speed receivers who can take the top of a defense, as the Eagles have an obvious need for someone who can get vertical in the passing game. Washington fits the bill, as he has averaged 19.2 yards per catch over his career. Note above that Washington does a great job adjusting to balls in the air that aren't perfectly thrown, which is something Carson Wentz could have used against the Lions this season. JuJu Smith-Schuster, WR, USC (6'2, 220): (20) USC at (4) Washington, 7:30 p.m.
USC WR JuJu Smith-Schuster probably shouldn't be punished for previous busts who have played at his school, but it's kind of hard to overlook. (I won't guess on why USC has had so many disappointments at the skill positions, but have produced quality pro players at other positions). Smith-Schuster has good size at 6'2, 220, and he seems to enjoy contact once he has the ball in his hands. He had good YAC ability, breaking tackles with his thick build. He can also beat defenses over the top, and make difficult catches in traffic. Smith-Schuster is a likely first-round pick. Would the Eagles dare go the route of the first round USC receiver after Nelson Agholor? Jeremy McNichols, RB, Boise State (5'9, 207): (22) Boise State at Hawaii, 7:00 p.m.
McNichols is in the second year as the lead back at Boise State. His numbers the last two years are incredibly similar to Doug Martin's last two years at Boise when he was a first-round pick coming out of college. McNichols is a hard runner with a nose for the end zone (46 total TDs the last two years), and his receiving ability should interest Doug Pederson, who emphasizes that attribute in his running backs.